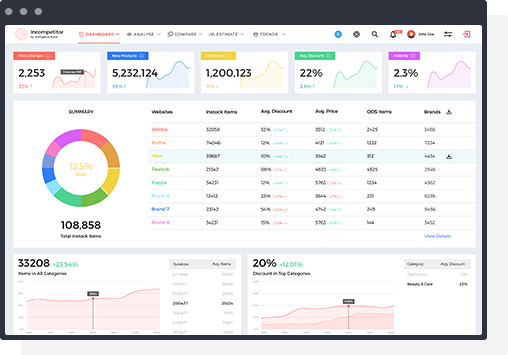 Spot market trends faster with competitive retail data for any e-commerce retailer, category, or brand. Go deeper. Get detailed data at a sub-category and attribute level. Monitor competition's catalog movement, including added, removed, and out-of-stock products. 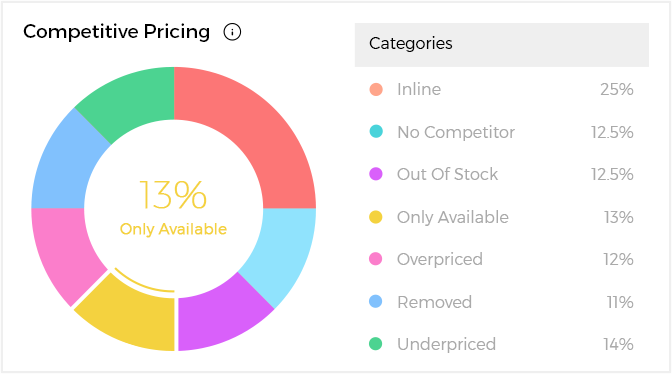 Our sophisticated price optimization software analyzes your competitors' feeds and internal data to make pricing simple. Maximize profit margins with recommended price estimates and data on Minimum Advertised Pricing (MAP). Compare 'apples to apples' with our product taxonomy, which normalizes product data for consistency with refined matching accuracy 'like' product. Prevent ill-timed out-of-stocks and excess inventory by knowing what shoppers are buying from you and your competitors. Adapt your merchandise to meet demands on time. Spot what's hot and know exactly which products shoppers want. Access rich market data down to individual SKUs, product attributes, categories, or brand. Gain visibility into product catalogs, and pinpoint hot categories and products for timely promotions to increase your sales. Inoptimizer® helps retail companies achieve real-time price optimization. Infeed™ combines the world's largest market feed with the shopper's voice. Hook™ is a B2C fashion discovery app, powered by a first-of-its-kind AI.